Star, The Wishing Ox was a collaboration between Tyler Bell and Catherine Haggarty. These artists each have their own perspectives, approaches and unique styles, but they have shared a working relationship for almost five years. 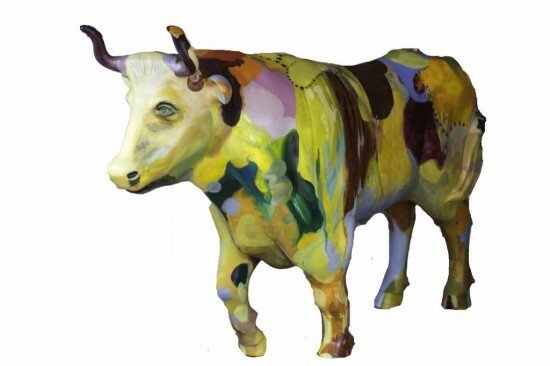 Since The Stampede embraces community engagement and creative solutions, Star is a ‘Wishing Ox’. This concept is based on cultural traditions related to gathering places for wishes and spiritual offerings, made popular recently by Yoko Ono’s interactive Wish Trees in New York and Washington, D.C. Star will be an interactive, ever shifting sculpture that engages participation from bystanders and viewers. Tyler’s strength as an artist is color. Tyler has a very specific and sensible approach to color and an incredible eye for blending and creating colors most would not think of. Catherine worked with Tyler on the base color and pattern, then added details, surprises and embellishments to accent his work.